The Toshiba TCxWave 6140-14C is one of the most versatile POS store systems on the market with a sleek, stylish appearance and a powerful performance specification. It is one of TecStore's most popular terminals among busy high-end retail stores, fast-food chains and fine dining restaurants - for good reason. The impressive TCxWave has a distinctive smart design, solid build quality and intuitive touch interface which means it will stand proudly in any store environment. It is designed to establish a new benchmark for the next-generation of point-of-sale systems. Jointly designed with IBM, the Toshiba TCxWave supersedes the internationally popular Toshiba ST-A10 and ST-A20 range of machines, but builds on the robust design and long-term reliability with an award-winning innovative and futuristic design. The slimline TCxWave touchscreen has anti-glare screen protection. The unit has a high-performance solid state drive and a fast Intel processor. With its overall robust build quality it is designed to give years of trouble-free operation that is associated with the Toshiba and IBM brands, backed with the confidence of a 5 year manufacturers warranty. The TCxWave has a number of ports. RJ to 9-Pin RS232 Serial adapters are available for the 2 serial ports, as well as USB to RS232 9-pin adapters - please contact us. For supermarket use, integrated keyboard options are available. The optional MSR reader is suitable for loyalty cards, staff login and membership cards. There are 2 fixing methods for the optional rear customer displays - either (1) integrated Rear Customer Display which is fitted to the back of the touchscreen terminal, or (2) Remote Customer Display which is mounted on a remote pole and connected to the main terminal with a cable, and can be adjusted to the desired viewing angle. Both Customer Display formats are available as either 2-line Character Display or a 10" Graphical LCD Display. Please check the chosen format is supported by your POS software. 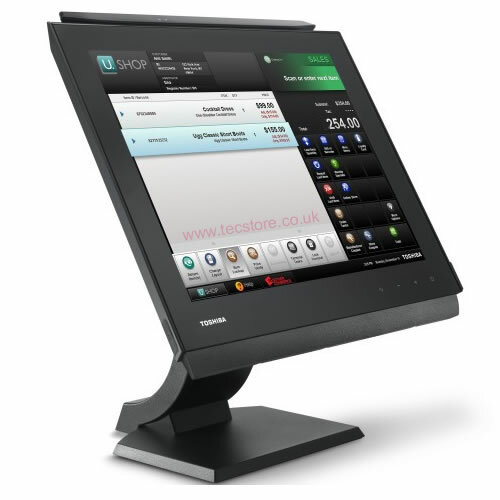 As standard, the TCxWave 6140-14C 15" touchscreen panel is fitted to its counter-top stand. Optionally, you can remove the stand and fit a VESA-compatible 100mm x 100mm bracket to mount the touchscreen on a pole or wall-bracket. A counter-top pole mount with dual brackets for the 15" touchscreen and the 10" customer display is also available as an option, with either tilting bracket or swivel short/long arm with tilting bracket. A retail-hardened touchscreen POS terminal with smart look and appeal, solid durability, anti-glare screen protection, high-performance solid-state drive and the confidence of a 5 year warranty. Upgrade to a bundle for just an extra £250 with Datalogic barcode scanner. 80mm-width printer with USB interface, UK power supply. Discounts available for quantity purchases on the Toshiba TCxWave - please Contact Us for a quote. We can also supply SurePOS 500 / 570, TCx-300 and TCx-700 range of POS terminals. POS Software with a permanent Lifetime License without any ongoing monthly or annual license fees is available at a discounted price when purchased with a touchscreen terminal. We offer a range of market-leading software packages - see POS Software choices in the Options box above. Programming of your menu/products and screens, Operator/Manager Training and Technical Support services are available - please contact us with your requirements for a quotation. Prices start from £175. Please note POS software support is chargeable at our normal fees if you do not purchase Programming and Training services with your system. Alternatively see our Complete POS Packages which include hardware, software and set up / training services.